This week I've been helping a friend decorate their house for their Halloween party / wedding reception. His house is just amazing! Each room is unique and every time I visit I notice something I didn't see before. We needed something for his formal sitting room that filled the large space but didn't over power the room. I've seen awesome pictures floating around Pintrest of paper bat and I knew I wanted to make them for this room. This is one of the simplest projects I've ever done but the result looks like I spent all day cutting and folding bats. Then I added two score lines so the wings would fold, duplicated the bat at different sizes to fill my 8.5 x 11 card stock, and cut them out on the cardstock setting. I cut out about 50 bats to fill this wall. These bats came out so cute and it took less than $2 worth of cardstock to make them. Maybe next year I'll get around to making some for my own home. I'd love to see your Halloween decorations! Comment on this post with your pictures or tag me on Instagram @KKuss. This weekend I tried cutting my own nail decals for the first time. I have to say I'm totally hooked! I can't get over how cute they are! And they're a great way to use up all those little scraps of vinyl I can't bring myself to throw away. Here's how you can make your own with the Cricut Explore. First upload the images you want for your decals and size them to fit your nails. I made the width of mine around 0.25 to 0.30in. Once you have them the size you want, hit 'Go' to get to your mat layout. There I duplicated my images to have as many as I needed. Make sure to cut more than you think you'll need. Since they're so little and delicate, you might mess up a few when your weeding them. For your cut settings, turn the dial on your machine to 'Custom' and change your setting in the drop down menu to 'Washi Tape'. This setting allows for very detailed and delicate cuts. I used outdoor grade Oracal (651) vinyl but I think a less sticky indoor type vinyl would work just fine too. Ta-Daa!! And the're done! Then very carefully weed your images. I used a straight pin to get out the little pieces. All that's left is applying them to your nails. I can't wait to make more. I'm just amazed at how small the Explore cuts. I just got the text that my friend had her baby and it's a boy! I had a feeling it would be. I'm so happy for them. I can't wait to meet the little guy! I'm going to visit them later today and I wanted to make him something special but I wasn't sure what. They haven't reviled his name yet, so I can't go monogramming everything. 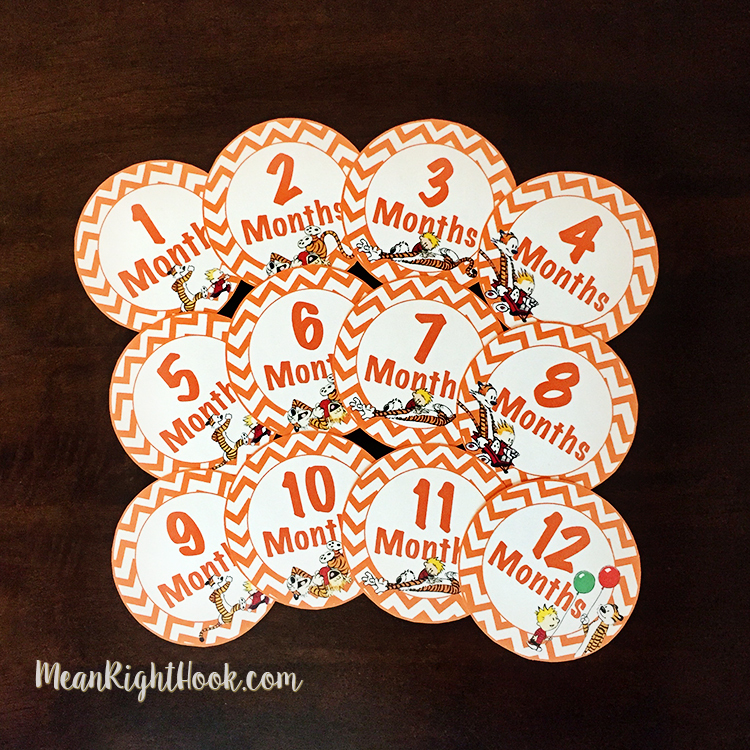 I decided to make him a set of monthly milestone stickers. My friend had a super cute Calvin and Hobbes mural painted in his nursery so I knew exactly what theme they should be. I hope she loves them! They were so much fun to make and they didn't take much time at all. If you'd like to make your own, you can download the set for free! All you need is a printer and printable shipping labels. I used Avery® White Full-Sheet Labels for Inkjet Printers.